Often compared to Ibiza and championed as its yet unspoiled festival focused alternative with great value for money, Zrce beach is becoming the new party epicenter. The beach is a well-known Croatian summer destination for partygoers, with several all-hours discotheques and beach bars operating during summer months. It is one of over 100 Blue Flag beaches in Croatia, having been given the award in 2003. Hideout operates in four open-air venues on a blue flag beach with stunning mountain views, beach bars and restaurants. Zrce Beach is located around 1.5 miles from Novalja town centre and is well served by the festival shuttle service 24 hours a day. 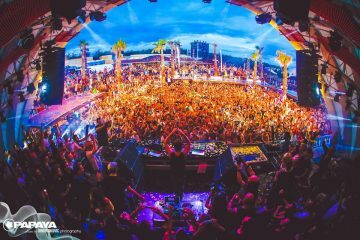 Taking place just a few days after Ultra Europe Music Festival, the gates to Dream Island Festival open which is located at the breathtaking Noa Beach Club from the 18th-20th of July 2016. Join thousands of other like-minded paradise hunters as we escape to one of the greatest locations in the globe. As a proud member of the ‘Top 100 Clubs in the world’ list (source DJ Mag)”, Noa Beach Club steals the show with its awesome design which features a central pool, 5 bars and an incredible dance floor making it one of the wildest party hotspots in the Mediterranean. This is going to be one of the unmissable shows of the summer! Expect an incredible lineup, an electric atmosphere and more sun than you can imagine. It’s time to make your way to Dream Island! The boat parties are the perfect place to catch festival headliners in an intimate setting with a limited capacity set amongst the Adriatic sea. Tickets are extremely limited for these parties and run during the main festival days. Tourist Tax – 1.oo € per person per day will be charged extra as per Croatian Law and will added to your bill.